We took a river trip through the centre of Berlin today, and somewhere near Monbijou Park I watched a troupe of young people – puppetry students? – in black hats and white faces, following a floppy orange skeleton plodding along the river bank, controlled by long sticks manipulated by the students. There was an earnestness about the performance that I suspect might lie behind a lot of the seemingly spontaneousness art you see in Berlin. 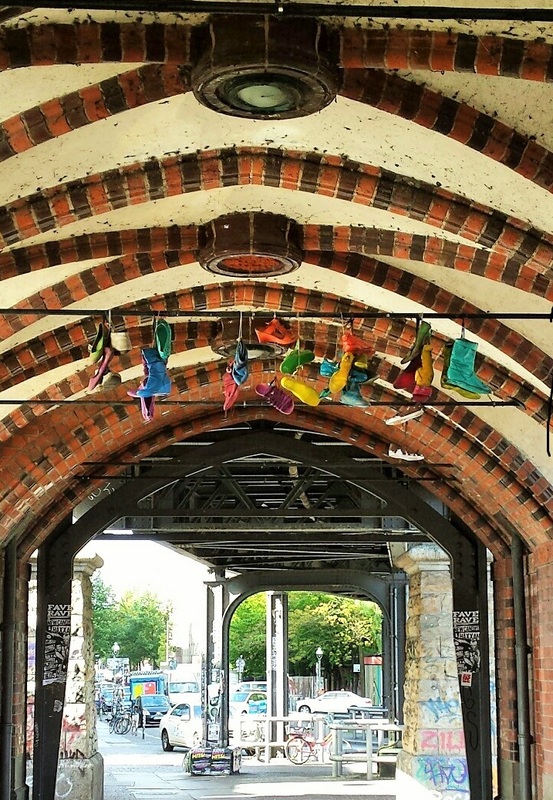 The sponge skeleton and its disciples reminded me of our early morning walk across the quaint Oberbaumbrücke bridge, with its fairy tale towers and vaulted ceilings. The shoes hanging from the ceiling are bright and apparently new. In Australia, shoes hanging from a power line are supposed to mark a drug deal location, but are more likely the spot where a drunk had his shoes pulled off by his mates. So what happened here? An art school assignment? A short film for a competition? Site of a spectacular drug transaction? Or did fifteen drunk people have their coloured shoes pulled off by their mates?